Sailing and Power Boat Tips from Gulf Islands Cruising School Ltd.
Last weekend I attended an Open House at the New Marine Centre located in the Sidney Pier Hotel & Spa. The Centre is situated on the ground floor of the Hotel with a great waterfront view. The Centre is empty at this time, however we were treated to a tour by Gabrielle Morris, Design Coordinator who shared the plans for the new facility. It will be an amazing facility with an educational focus, “Learn to Love Your Ocean” and will operate as an educational centre and aquarium. One display will show the life under the Pier with the water level in the display synchronized with the actual tide. Looking forward to the opening in spring 2009. I spent the last week at Malibu Club instructing the staff so they could acquire their Transport Canada certificates to operate the Small Non-Pleasure Vessels. Six persons attained both the MED A3 and the Small Vessel Operator Proficiency certificates. 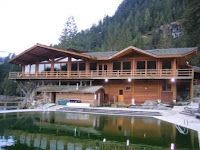 Malibu Club is operated by Young Life and it is a tremendous facility. Originally a private lodge, it has been expanded and renovated with new construction underway. Great people and a breathtaking location. 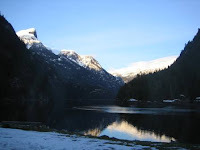 The property is located overlooking Malibu Rapids at the entrance to Princess Louisa Inlet from Jervis Inlet. A sure sign that spring is near! June 26 – 29, 2008 The Victoria Tall Ships festival will coincide with the 150th anniversary of the establishment of the Crown Colony of British Columbia; a fitting addition to a year that will be rich in history and special events. Become involved as a Volunteer! See photos from the 2005 Festival. Port – The left side when facing the bow. Starboard – The right side when facing the bow. 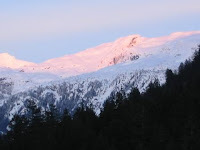 Windward – The direction from which the wind is coming. Leeward – The direction in which the wind is going. Amidships – the mid point of the boat between bow and stern, or from side to side. Abeam – A direction to either side of the boat at right angles to line from bow to stern. Ahead – in front of the boat. 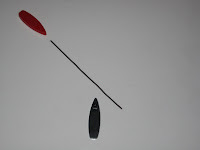 Tacking – Turning from one tack to the other, when the bow passes through the wind. Also know as Coming about. Port tack – when a boat is sailing with the mainsail on the starboard side. Starboard tack – when a boat is sailing with the mainsail on the port side. Gybing – Going from one tack to the other with the stern passing through the wind. Underway – when the boat is not moored, anchored or aground. It is floating free from the earth. Leeway – the motion of the boat to leeward. No way – when the boat is not moving. In irons – when the boat bow into the wind without control and starts to move backwards. Upwind – In the direction from which the wind is coming. Downwind – In the direction the wind is going. Luffing – when the forward part (the luff) of a sail is fluttering. Heading up – turning towards the wind. Bearing away – turning away from the wind. Sailing by the lee – sailing with the wind and the boom on the same side while sailing downwind. Heeling – The leaning of the boat due to the wind pressure on the sails. Astern – behind the boat. The International Regulations for Preventing Collisions at Sea, also know as ColRegs, are the laws the govern vessels at sea. The Basic rules for Power-driven vessels are the same as the rules we use on the highway. Rule 11 states “Rules in this section apply to vessels in sight of one another” Therefore if you are operating in restricted visibility, the following Rules do not apply. Rule 12 deals with sailing vessels and this rule will be covered in another post. Notice the Rule says “any vessel”. The word “shall” means “must”. A case that many people mis-understand is where we have a sailing vessel overtaking a power vessel that is moving slowly, perhaps they are fishing and trolling for salmon at 2 knots. Because the sailing vessel is overtaking the power driven vessel, the sailboat must keep clear. Many people have been taught that power always gives way to sail. The question then becomes “When am I overtaking?” Rule 13 (b) states “A vessel shall be deemed to be overtaking when coming up with another vessel from a direction more that 22.5 degrees abaft her beam.” In simple terms if at night you would only see the white stern light and not the sidelights. In highway terms if you saw only the taillights of another vehicle, you are overtaking. Rule 14 “Head-on Situation When two power-driven vessels are meeting on reciprocal or nearly reciprocal courses so as to involve risk of collision each shall alter course to starboard so that each shall pass on the port side of the other. On the highway this would be the narrow road situation. When meeting another vehicle, everyone pulls over to the right. Rule 15 “Crossing Situation When two power-driven vessels are crossing so as to involve risk of collision, the vessel which has the other on her own starboard side shall keep out of the way and shall, if the circumstances of the case admit, avoid crossing ahead of the other vessel.” The highway version is two vehicles meeting at an uncontrolled intersection. The one on the right is right. I have had two instances recently where Rule 15 has been broken. The first was while teaching aboard a 86′ Queenship motor yacht. We observed a Grand Banks 42 trawler approaching about 2 miles away off our port bow. The lady who was on the wheel observed that we had a potential risk of collision and that we were the stand-on vessel and therefore required to hold our course and speed. We discussed that the trawler should be altering course to cross our stern. As the minutes passed we could not detect any alteration of course so I suggested that we slow down. The other vessel kept proceeding and we then went to neutral on both engines. The trawler crossed our bow within 0.1 miles with the skipper waving his arm at us. I noted the vessel name on the stern and called him on Channel 16. When he responded I switched to Channel 9 and he told me we had a fender that was left down on our port side. When I thanked him I noted that we were the stand-on vessel and that we had to stop to avoid a collision, his reply was “Oh, sorry”. In the diagram, I am aboard the black vessel. The second instance was as we were returning to Tsehum Harbour in Sidney aboard a 38′ Meridian. There was a large 100’+ private motor yacht anchored near the Harbour entrance off our port bow. One of the local crab boats was approaching on our port side and heading for the gap between us and the anchored yacht. Despite me blowing the danger signal, 5 short blasts, the crab boat crossed our bow. In order to clear us safely, he had to alter course to port and cross the bow of the anchored yacht. 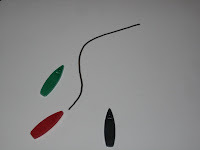 In the diagram the crab boat is red and the anchored yacht is green. The major point to remember is always keep checking that the give-way vessel is taking action to keep clear and if not, you must take action to avoid a collision. Never assume that the other boater knows the rules or will follow the rules correctly. These rules form part of the required knowledge of the Canadian Yachting Association Basic Cruising Standard. Receive our Free 22 Page Report, Boating Information, The Fundamentals by entering your name and email in the form below.